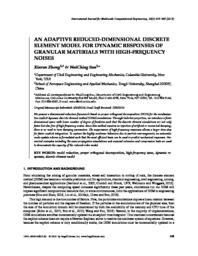 We present a dimensional-reduction framework based on proper orthogonal decomposition (POD) for non-dissipative explicit dynamic discrete element method (DEM) simulations. Through Galerkin projection, we introduce a finite dimensional space with less number of degree of freedoms such that the discrete element simulations are not only faster but also free of high-frequency noises. Since this method requires no injection of artificial or numerical damping, there is no need to tune damping parameters. The suppression of high-frequency responses allows larger time step for faster explicit integration. To capture the highly nonlinear behaviors due to particle rearrangement, an automatic mode-update scheme is formulated such that the most efficient basis can be used to predict mechanical responses. Numerical examples including, the wave propagation simulations and uniaxial extension and compression tests are used to demonstrate the capacity of the reduced order model.